I had a hard time trying to find fonts and colors to fit without screwing up the design. I originally was going to do captions in the Events section (where the dates, numbers are in one of the empty blocks). Then scratched that idea quickly. Then decided under the pics to at least mention WHO was in each particular photo.. but that really screwed up the format. I had chat bubbles and that really made it look worse (and cheap..). I had blocks where I had the captions IN the photos but for the smaller photos they basically cut off the photos making them even smaller. So I settled with this one alternating between black and white font in hopes it didn't blend too much into the background. One of my longtime Sasuke friends (Thanks Cathi!) 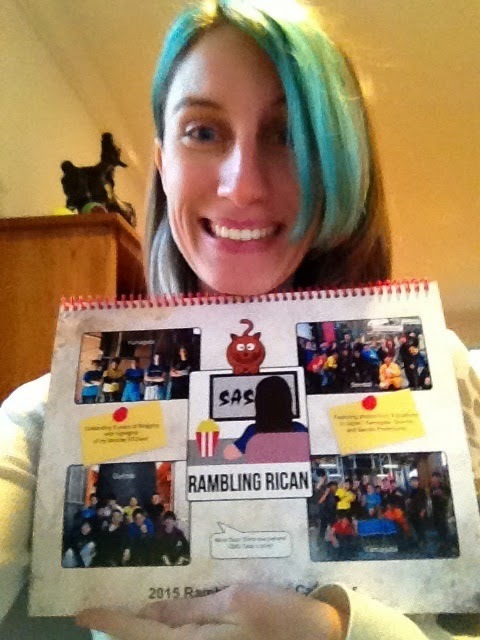 suggested to add my own Rambling Rican captions like I do on the blog offering my own thoughts on some of the photos. Hubby toned down some of my more wtf moments (he did say and he's right.. this is a family friendly calendar that can be put in any home with children present) so he took out some of my lines and acronyms. Oh future editing projects will be fun and I have to put my ego in check! He is right though as painful as it is to admit it. I moved photos around, took some out, added some in, changed format, order.. heck I fought with the damn thing for 3 straight days! If in the future people want pristine photography photos (like a photobook – which this site also does) then the only marking on the photo would be a copyright. I'm more than amiable to expand on that in the future. But for now this will work. The first year with any project is the most difficult to create. I can change it for next year if I get too many complaints but so far this is the direction I got from my longtime readers (and the most approvals). I know that I won't be able to please everyone sadly but that is the nature of varying opinions. Especially when money is involved as it is in this case. Full disclosure on the "fundraising part" of the Calendar Project. I'm getting about 5-7 dollars per calendar created (not sure if I get hit with back end fees like most companies do these days - if not it's 7 bucks at the top end). All of the prices are up on their website along with a description as to how this works. This is the first time I'm using this website and hope the experience is positive. The calendars are only printed when someone orders them as opposed to other companies that require for a certain amount to be ordered up front. While they also had an option to do a fulfillment drive (like they do in local schools with the sign up sheet) I chose the other route available. They will be doing the fulfillment so I don't have to be the middle person. I won't know who orders are from as the website takes care of that privately between the buyer and them. So far I've had zero issues other than creative issues on my own. I appreciated they had no set up fees (some websites can cost 100-200 bucks just to set up) and their reviews are overwhelmingly positive (yes I checked outside websites and Googled their names). Consider this a test run. If this year works out well I will continue to do this and even expand on any of the other stuff they offer (like photo books, cards, etc.) if people are interested in buying some sort of merchandise that will help me as well. So if you want to contribute to the kitty and get the inaugural calendar (it comes in 2 sizes apparently although I formatted it for the smaller one) you can buy it directly on CreatePhotoCalendar's website! The website accepts Visa, Master Card, Checks, Money Orders, and Paypal. They ship to the USA, Canada, Mexico, Puerto Rico, U.S. Virgin Islands, United Kingdom, New Zealand, Europe, Russia, United Arab Emirates, Philippines, India, Thailand, and Australia. As always I am eternally grateful for your continued support throughout the years and I hope to continue by expanding and reaching that ultimate dream of writing about Sasuke at it's source: Japan! One of my friends (who is also an Author - Forgotten Fox (Book 1 of The Celestial Saga) shown here) was nice enough to send me a photo of her holding a Calendar she bought. That is the standard size 8 1/2 x 11 calendar. I also got a few of them (to mail out to the guys as thank you's) and having never worked with the company before, I have to say, the calendars are a reaaaaally nice quality! The calendars are actually heavy stock and really hefty for their size! I wasn't sure the quality of product but I'm quite pleased! Took a slightly different approach than I was expecting but I do like the look as a whole.I'm trying to buy one but the site Doesn't work on phones or tablets so I'll try on the laptop later. I hope next year's I may have a variety of calendars for people to choose from. It's been kicked around. Depends on what kind of photos I can get and of course permission from the players involved. I'm hoping in this learning year they like what was done or even offer to participate. Keep me updated and I hope you get it to work on the laptop. Much appreciate the support! I have been trying to purchase as well but can't get through.... As someone mentioned, can't be supported by mobile devices and my laptop is wonky. Will have to borrow someone else's PC to buy it! Guess there is no way to make it mobile friendly? I'm sorry :( You aren't the only one. I'd be willing to help for those outside the area if they'd be willing to cover the cost of the additional shipping. It will take longer though as I'd have to get them first then ship them back out to the area's not covered by the website. Awwww Thanks for the support! Yeah.. international shipping.. yikes.. That's really sweet. Thanks again! Bright note about my living and financial situation having recently changed (moved unexpectedly, couldn't get home from second job, but thankfully could afford to quit it now): I can afford to buy one of these! My housemate (who I got hooked on Sasuke (g)) told me I had better buy one if I could afford it, so both of us are waiting for the awesomeness. Yay thanks for the support! I know it's a totally niche item but I figured I need to start somewhere! Been too drained to get online and post to let you know that I did get my copy, right before Christmas! Both my housemate and I loved it. I put it up on my bedroom wall today, so we can both look at it. I'm glad you put Moody along with his name - I'll admit that I couldn't remember that, although Hioki at least I do know without his nickname, which I cracked up when I saw that there even though I knew I would see it. 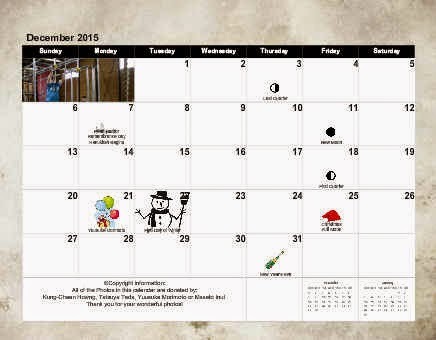 Btw send me a pic of the calendar on the wall! I get a kick out of seeing them! Holiday Fun 2014 - ElfYourself!